If liberals were never allowed to complain, they simply wouldn’t speak. Fact is, most of the things liberals actually accomplish all start with complaining. And usually end in complaining. Most of the work being done, frankly, is being done by conservatives. The lib complaining just drives the engine forward. So it’s nice to hear a story where liberal complaining literally does nothing at all – stops no one, starts no riots, and gets no good conservative politician fired. After all, as one Dairy Queen store owner knows, anything that makes libs complain is good for business. 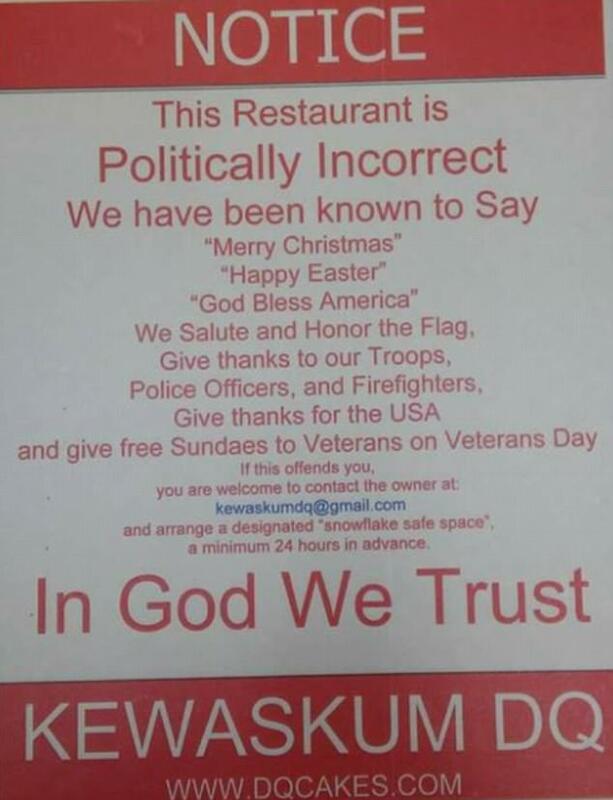 Wisconsin Dairy Queen owner Kevin Scheunemann generated a lot of buzz — and a lot of business — when a “politically incorrect” sign he posted on his store door offended an out-of-towner who took to social media to complain. Now, to be fair, there’s a lot of things that I would find offensive on a front door. Maybe Scheunemann’s sign went too far? Or maybe the sign didn’t go far enough. You’d think, though, that with the ‘snowflake safe space’ jab, liberals would have gotten the hint. Or at least not made themselves part of the joke. But owner Kevin Scheunemann doesn’t mind. He is, like most conservatives, a good businessman. And his business isn’t hurting one bit. And that was a CBS reporter’s quote. If the Mainstream Media can admit it, perhaps the rest of us can as well? Or if not the rest of the country, perhaps the rest of the town of Kewaskum, Wisconsin? It seems the town is right in step with Scheunemann. Poor lib snowflakes – no safe space for them in Kewaskum.